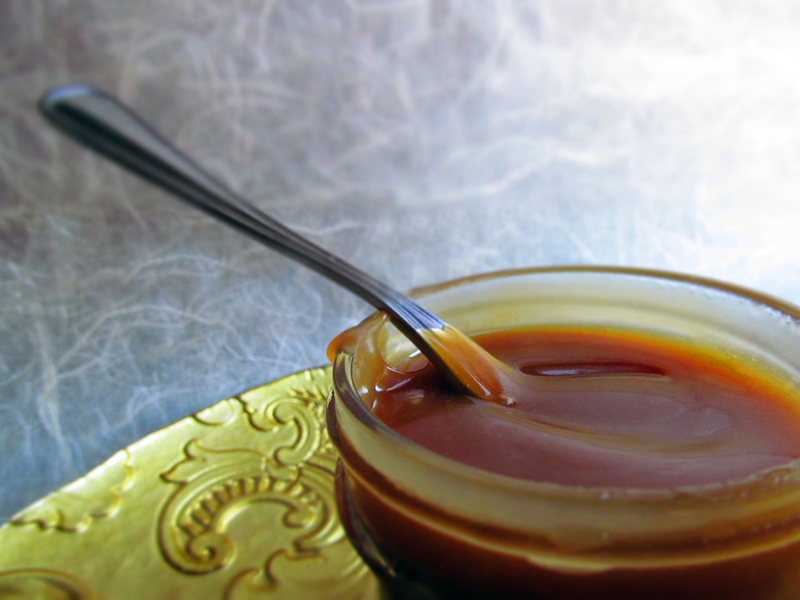 We use this amazingly simple Salted Caramel sauce for our Salted Caramel Ice Cream and Salted Caramel Apple Pie. It is so versatile that you can use it on just about anything and everything. My favorite combo for this caramel is a spoon! The caramel takes about 10 minutes to make and no candy thermometer is required. We used unsalted butter in our recipe, but you can use salted. We prefer to have full control of the saltiness… There is nothing like ruining your almost-perfect caramel by adding too much salt. Also, the caramel will thicken up as it cools, so make sure you allow the caramel to cool down completely before using. Sugar will form clumps and eventually melt into a thick amber-colored liquid. Continue to stir and be careful not to burn. Once sugar is completely melted, immediately add the butter. Caution caramel will bubble when the butter is added. Once the butter is fully incorporated in the sugar, slowly pour the ½ cup of heavy cream. Once again the caramel will bubble and possibly splatter. Allow the mixture to boil for 1 minute to fully incorporate. Remove from heat and stir in 1 teaspoon of sea salt. Allow caramel to cool down before using. Cover the caramel tightly and store for up to 2 weeks in the refrigerator. Before using, remove from the refrigerator and allow to come to room temperature.